This film meant to show Hitler’s terror methods as in a parable. The slogans and beliefs of the Third Reich were placed in the mouths of criminals. – Fritz Lang on the occasion of The Testament of Dr. Mabuse‘s premiere in New York, 1943 (1). Fritz Lang was a notoriously unreliable commentator on his own life. Lang’s most famous story, probably because he so frequently retold it, involved him being summoned by Goebbels to the Ministry of Propaganda one night, early in 1933 after the banning of The Testament of Dr. Mabuse, to be offered the position as the Führer of film at the new agency supervising motion-picture production in the Third Reich. It was at this moment that Lang realised he had to flee Germany, and at the completion of his meeting with Goebbels, the director made a midnight dash from Berlin to Paris by train. There are many inconsistencies in Lang’s various retellings of this story and the surrounding facts and accounts don’t support Lang’s version(s) of events (2). Many artists and intellectuals left Berlin immediately after the Reichstag fire on February 27, 1933, yet, for several months after this date Lang gave credibility to the Nazis by attending official film functions organised by the Nazi Party hierarchy (3). More and more it appears that the sycophantic Lang courted those in power (in both Germany and America) to maintain his position. It is quite possible that Lang’s insecurity fed into the fearful, paranoiac visions of ordinary men who transgress the values of a conservative society found in his film noirs and in The Testament of Dr. Mabuse. Siegfried Kracauer, in his history of German cinema, easily saw portents of Hitler’s rise in virtually every German film (4). Hindsight makes it is easy to mould Testament, the tale of an insane leader who incites his minions to inflict meaningless acts of terror on the general populace so as to destabilise society, into a rabid anti-Nazi work, yet an equally opportunistic reading of the film could comfortably see it as a prescient work supporting Bush’s War on Terror. By 1942-3, to coincide with the release of Hangmen also Die! (1943), Lang had established his anti-fascist credentials by citing his midnight dash and enunciating the supposedly anti-Nazi theme of Testament. 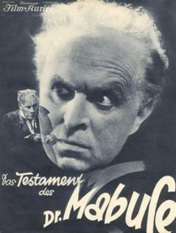 Although Testament was banned in Germany, for whatever reason (and it was suggested in France at the time that this was because the film’s producer was Jewish), it was passed for exhibition in the other German-language markets. Additionally, although many of Lang’s silent films are allegorical in nature, the coming of sound must have made Lang reconsider this mode of representation as his sound films aren’t very allegorical. Lang’s much-cited statement about the Nazi’s slogans being placed into the mouths of “Mabuse” and his gang just isn’t true. Although a number of Lang’s film can be considered political, most obviously Man Hunt (1941), Hangmen also Die! and Ministry of Fear (1944) the politics in these films reinforces the status quo rather than undermines or questions its values. Meanwhile, the allegories of Die Nibelungen (1923-4) and Metropolis (1926) were seen by the Nazis as having positive political and ideological values (and, incidentally, Metropolis was later read as being socialist). In Germany in 1932 Lang was a commercial filmmaker at the height of his powers. Two of his great successes had been Dr. Mabuse, the Gambler (1922) and M (1931) and, although Lang had previously stated he would not make another Mabuse film, the canny producer of M, Seymour Nebenzahl of Nero-Film, convinced him otherwise. Testament pits the insane master criminal Mabuse (or his proxy) against Löhmann, the master detective introduced in M. Rudolph Klein-Rogge and Otto Wernicke reprise their roles from the earlier films. Dr. Mabuse, the Gambler was an exaggerated thriller similar to Feuillade’s earlier fantastical serials. To make the film more realistic for audiences Lang incorporated contemporaneous news events. Mabuse was portrayed as partially responsible for the events of the tumultuous post-WWI period. Onto this Lang grafted a quasi-documentary attention to procedural detail that can be found in many of his films. This realistic attention to minutiae gives the plot, no matter how absurd, some credibility. With Testament, Lang extends the themes of Dr. Mabuse, the Gambler through the addition of sound. Lang plants details of then recent news items to give credibility to this tale of hypnosis, insanity and mindless mass destruction. The film’s incidents of the theft of explosives and poisons from pharmacies, blackmail and a jewel robbery had all been sourced from Berlin’s newspapers of the time. Documentary inserts of street-life add a realistic touch, and again, police procedural details abound. Löhmann’s discovery of the scratched pane of glass is fully rendered, as is the process for decoding the message that the police photographer uses. However, this realism is counterbalanced by a strong expressionist component that underlines the insanity rampant throughout the film. No less than three of the main characters are insane for much of the film. Through various techniques Lang helps the audience to experience this disturbing psychosis. When the insane Hofmeister tries to tell Löhmann who is behind the crimes, the imaginary desk and phone in his hospital cell is shown to be made of glass. During the nighttime car chase Lang rear-projects negative film that gives the trees an eerie glow. Although Lang attempted to create a largely realistic film he did not abandon his capacity for creating spectacular, unusual imagery. In Testament Lang continues the exploration of sound he began so spectacularly in M. The film begins with a brief list of credits accompanied by a short piece of music. This music mutates into the loud industrial sounds of a factory. This matches to an image of a cluttered storeroom, vibrating from the intensity of the noise. This noise continues for the first five minutes of the film, drowning out all other sounds, and because of this, the film playfully reverts to being a de facto silent film. The camera tracks down a room to a man crouching in the corner. He appears stressed and wipes his brow: Is he listening for something or is he scared of being discovered? Throughout the film Lang plays on the ambiguous qualities of image and sound. Lang allows the sound to bleed from one scene into the next (as he had already done in M). For example, the ticking of a bomb becomes the tapping of an eggshell. And when Dr. Baum, Mabuse’s psychiatrist, gives a lecture about the detailed plans that the comatose Mabuse has written, this merges seamlessly into a gangland discussion of the plans. When a character is mentioned or implied, the next shot is frequently of that character. The triggering of a new scene by some aspect of the previous one frequently has a strangely disorientating effect. A sound suggests one thing, the image suddenly shows something else. The viewer requires a moment to readjust. Also, on occasion, there is a misleading ambiguity about the cues. In the process, Lang creates the disorder that Mabuse strives for. This sound/image editing technique also has the added benefit of increasing the film’s momentum. Interestingly, this experimentation with sound didn’t continue along the same path in his next, French film (Liliom ), nor into his subsequent American career. Perhaps Lang’s lesser familiarity with the French and English languages stopped his development in this direction? Despite its significance as one of only two sound films Lang made before leaving Germany, Testament is ultimately not as remarkable a work as M. Testament lacks Peter Lorre’s memorable, soul-wrenching performance, and it doesn’t have the clear-minded precision of the earlier film. However, Testament is still a great film that provides a perfect summation of Lang’s German career. Lotte H. Eisner, Fritz Lang, Secker and Warburg, London, 1976, p. 129. For a detailed analysis of this event read Patrick McGilligan, Fritz Lang: The Nature of the Beast, St. Martin’s Press, New York, 1997, pp. 174–181. Siegfried Kracauer, From Caligari to Hitler: A Psychological History of the German Film, Princeton University Press, Princeton, 1947.